@kroi Ha! They admit she's Rey of Light! Good, goood. Who will Light guide out of darkness I wonder? I did a fun 'Force Friday' shopping binge today at a couple of local stores. Stopped over at Target and was delighted to find a 'life size' Porg plush. Love this little guy...very well made, realistic looking, and even makes 'chirping' sounds when squeezed. Last one there....tossed up on top of a messy pile of random SW toys. This is the best looking Porg plush I have seen of the many out there...highly recommended if you are looking to add one to your collection. Seven20 is the name of the toy company that produced them. Also stopped over at the local Toys R' Us to see what was availible. Was delighted to find all SW Black Series action figures on sale, two for $20. A real deal, as they normally sell for $18 to $20 for just one! Picked up a coveted unmasked Kylo...and Captain Phasma for 'free'. Really looking forward to the new film even more after seeing all the new merchandise! @Kylo Ren's 8-Pack wrote: I did a fun 'Force Friday' shopping binge today at a couple of local stores. Glad you had fun shopping! Nice to see you stopping by here again! Thank you , it's nice to hear I've be missed! I do stop in now and then, as I do enjoy the continuing conversations and image sharing. I'll be visiting more often once the film is released, but I still pop in now and then just to read. Really loving the new imagery for Kylo. The new take on his costume is terrific. So looking forward to the next chapter. What I want to know is why TFA Kylo (with the hood) is showing up on all this new TLJ merchandise. For the sake of familiarity? @Cowgirlsamurai wrote: What I want to know is why TFA Kylo (with the hood) is showing up on all this new TLJ merchandise. For the sake of familiarity? Just had a thought that maybe Kylo is at Luke's temple because there seems to be a fire and some kind of ruin. Maybe it points to a flashback or vision Rey will have? “Rey grew up on the remote desert planet of Jakku, never suspecting that her destiny lay among the stars. 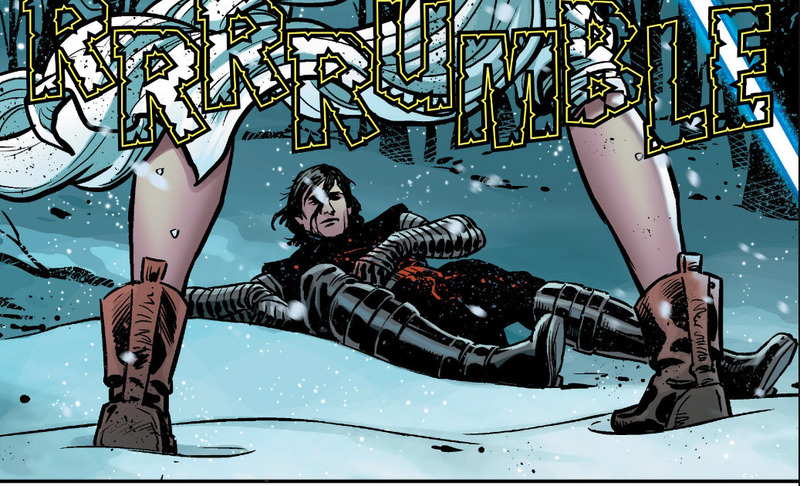 When she finally made her daring escape from Jakku, she embarked on an incredible adventure that brought her face to face with the dangerous Kylo Ren. The fiery First Order commander sensed the power of the Force in Rey, and now pursues her across the galaxy. Imagine epic adventures with these Star Wars Forces of Destiny adventure figures. Pretend to journey alongside Rey as she discovers her destiny and her connection to the Force. 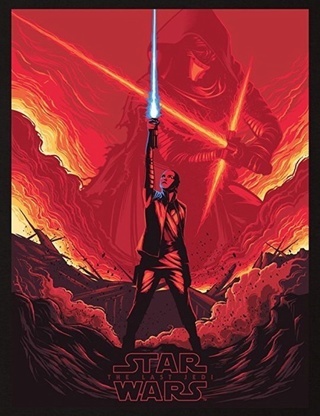 Or take imaginary command of Kylo Ren as he wields his fiery lightsabre in an attempt to stop Rey before her power awakens. These highly poseable figures feature removable outfits, boots, belts, lightsabres, and more. Re-create the battles and stories of Star Wars with this true-to-entertainment figure." I've no words. Wow. If I didn't know this was FoD description, I'd think it was a synopsis for an R rated Reylo fic. Removable outfits, boots, bets...Fiery commander...destiny lay among the stars. I foresee some inappropriate use period. Jesus, that reads like the back of a trashy paperback novel. Which by the way, will they ever explain the whole business of just testing her powers and becoming more dangerous. Which uh, homeboy kind of already helped her do. Just is that one of those details we'll ever get the full story about? @snufkin wrote: Jesus, that reads like the back of a trashy paperback novel. Which by the way, will they ever explain the whole business of just testing her powers and becoming more dangerous. Which uh, homeboy kind of already helped her do. Just is that one of those details we'll ever get the full story about? Oh yes! The equivalent of the one-star restaurant reviews on Yelp because the thing that the person wanted to order wasn't on the menu. Also most kids know about the birds and the bees at around 8yrs old. They'll be having fun taking off those outfits and boots and belts and making the dolls pose worthy of an ancient Indian text. Apparently it's been a busy day, and I'm only just now seeing this. I seriously have no words. Do they need to drum it home any harder that they're going to remove their clothes? I mean, this is right up there with ADF's "He touched her anew..."
And Rian Johnson is being so much more diplomatic and patient with the people screaming at him on Twitter right now. If it were an actual "I'm going to give this joint a one-star review because what I want (or think it should be) isn't part of the menu," most people I know who work in the restaurant industry aren't as chill. There'd be some pretty harsh comments in return and probably a couple of knives from the kitchen. Why are batteries required? Can they talk? @EchoBase wrote: Why are batteries required? Can they talk? especially combined with "fiery commander". I'm gonna buy the sh** out of those dolls. @Xylo Ren wrote: I'm gonna buy the sh** out of those dolls. I'm buying two sets--one for my daughter and one for myself. Hmm, Rose with a baton. She'll have hand to hand combat with someone. I'm getting those barbies. Amazon's fic-tastic description sold me 100%. Removable outfit you say? Done. I'll be buying a doll set for myself and two other sets for each of my nieces for Christmas.